The prognosis for the housing market in Falls Church is a very good one, despite the wider misery in the industry. An extraordinary telephone conference call involving realtors from all over Virginia and two George Mason University housing policy experts was held last week, presenting a very nuanced picture of the state of the distressed housing market in the Commonwealth. The call was held under the auspices of the Virginia Association of Realtors, and although realtors are always trying to characterize the glass as half full, there were a lot of important realities that issued forth, especially ones pertaining to migratory patterns among prospective homebuyers. Clearly, home values and buying patterns closer into urban centers are stronger than in more outlying and rural areas, and that includes most of what’s inside the Washington, D.C. beltway. That’s because there are stronger employment opportunity pools in urban centers that can sustain home values, and shore up households that are falling behind in payments and needing to find adequate employment. Realtors from all over the Commonwealth echoed the notion that the market remains relatively strong, even though prices have dropped in most areas, in certain pockets. But no one is buying the more rural areas, such as the southern part Prince William County and Loudoun County. This is in the context of a likely national recession, reported George Mason University’s Lisa Fowler, director of Housing Policy Research, and John McClain, senior fellow of the Center for Regional Analysis, both on the conference call last week. They produced a paper making this assertion called, “Virginia Housing Market in Uncertain Times, First Quarter 2008 Report.” They note drops in job growth, the U.S. Coincident Index, housing prices and consumer confidence, in the context of rising gas prices. However, they note that Virginia has fared better than the nation in recent recessions. Home sales in Virginia have dropped from 27,000 in the first quarter of 2005 steadily to 16,000 in the first quarter of 2008. In terms of median home prices, they were down 11 percent in the first quarter of 2008 compared to the year before in Northern Virginia, 28 percent in Prince William County, 21 percent in Loudoun, and 17 percent in Stafford and Spotsylvania counties. It is predicted that price drops in such areas will continue another 10 to 12 months. The most “dramatic” price drops will be limited to areas hardest hit by foreclosures, and those are outlying areas in Northern Virginia, where the rate is expected to be 111 out of 10,000 owner-occupied units per quarter by year’s end. In the context of all this, the Virginia realtors concurred that the rental market is booming, while prospective buyers wait out the dropping housing costs. But even more important than that transition is the one driven by the high cost of gas and labor market factors, taken together. Prospective buyers are looking to move closer in to urban centers, with an eye to cutting down on the cost of gas, in particular. Suddenly, some realtors said, the “walkability factor” associated with the location of a home is becoming vital. There is, in fact, something called the “walkability index” that was developed by a couple of “smart growth” advocates in Seattle and is available on the website, www.walkscore.com. This clever site ranks any address on a scale of 0 to 100 in terms of the proximity of vital services, ranging from grocery stores to restaurants, to coffee shops, bars, movie theatres, schools, parks, libraries, bookstores, fitness centers, drug stores, hardware stores and clothing and music stores. The score drops to 79 at the intersection of W. Broad and N. West St., and rises to 88 at the intersection of W. Broad and N. Washington. That means that anyone residing in one of the mixed-use condo projects already completed on the W. Broad St. corridor is living in a “very walkable area,” with more amenities easily within walking distance. The only service not within walking distances rated on the site is a movie theatre, with the nearest one in Merrifield that is about to be demolished (Falls Church developers, take note!). Of course, neighborhoods of major cities top the “walkability index.” Washington, D.C., is ranked the seventh-most walkable city in the U.S., behind San Francisco, New York, Boston, Chicago, Philadelphia and Seattle. In Washington, D.C., the most walkable neighborhoods, with scores of 99 and 98, are DuPont and Logan Circles and the U Street Corridor. 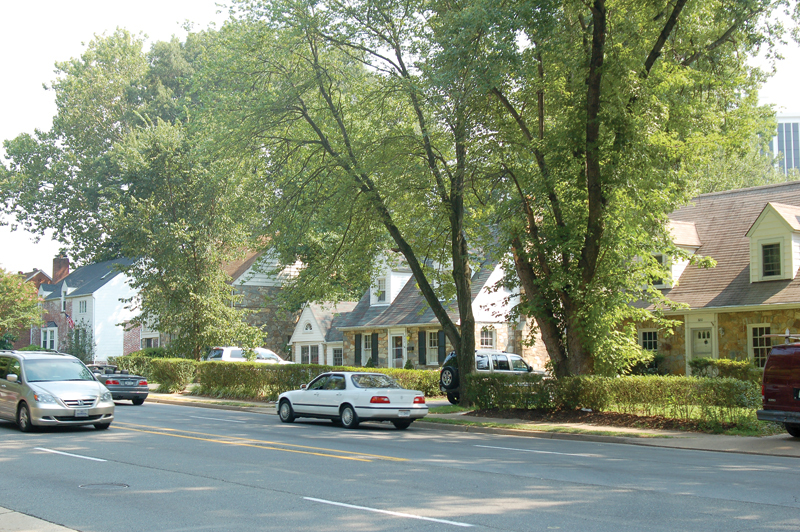 But the City of Falls Church is on the brink of attaining a mix of walkability and accessibility to the wider region that would trump any inner city neighborhood. It also has quick access to the Beltway, two international airports, an interstate highway and, via Metro and Metro bus, almost anywhere. 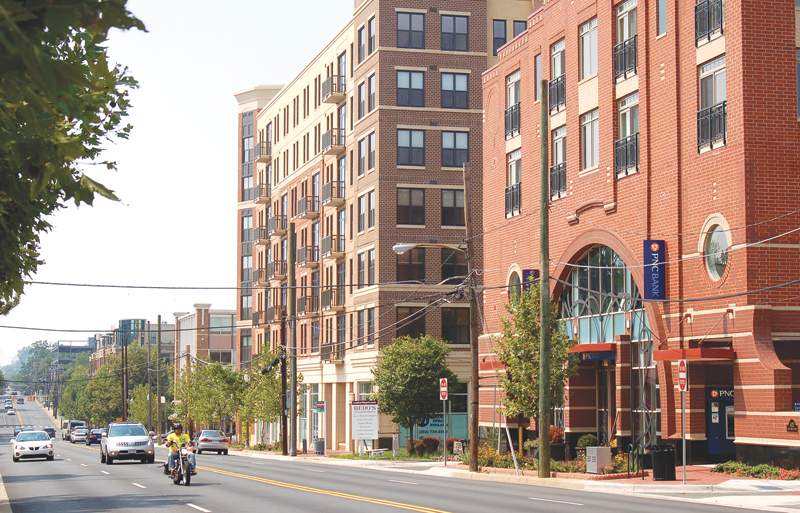 So, the prospect of the already approved $317 million Atlantic Realty City Center project in downtown Falls Church will only boost the City’s “walkability index” score to rival an urban downtown, making the community as a whole highly attractive for homebuyers looking to economize on fuel. Not only that, as some of the realtors pointed out in the conference call, the housing bill passed by Congress and signed by the president last weekend includes strong incentives for first-time home buyers. While the realtors hope this will boost the housing market overall, it is most likely that first-time homebuyers will be looking for smaller homes in the most walkable areas. That sounds a lot like condominiums in mixed use projects in a walkable community with easy access to transit and mobility. That sounds a lot like Falls Church.